PC users who get nagging popups by eFix Pro with recommendations to register the app can easily halt this activity by means of following the tips in this guide. Without cleaning up system junk once in a while, even a healthy computer will gradually slow down to a crawl and come up with errors. Avoiding this is a matter of appropriate OS maintenance, which is an activity that can be automated. System optimizers are the programs designed to fix registry problems, wipe out the redundant and obsolete leftovers from other applications’ functioning, and generally get things back to their smooth state. These are the tasks that the eFix Pro app is claimed to carry out. Nonetheless, the assistance in this case is accompanied by quite a few controversial effects that the user will run into. First off, the applet is sustained by a malicious browser extension, which in its turn ends up on one’s machine without the user’s approval. The drive-by setup is usually completed when you download and install another piece of software with the PUP (potentially unwanted program) covertly built into the wizard. 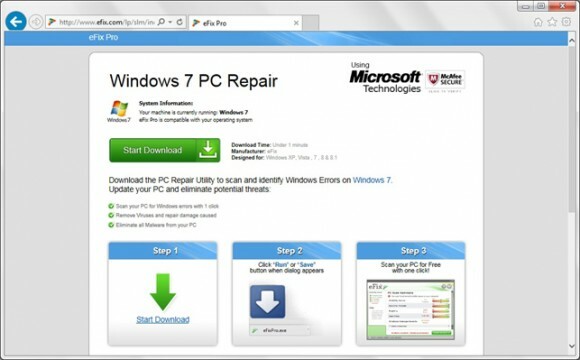 In the event that process gets through, the web browsers such as Firefox, Chrome and Internet Explorer will be constantly triggering new tabs or separate windows with eFix.com, where a repair is insisted on. These landing pages display the target Windows operating system version and state that the PC can be optimized with the tool. The popups are very annoying and fairly hard to get rid of. 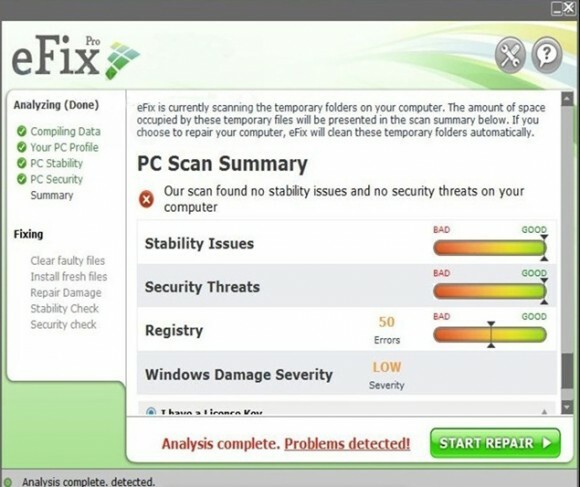 The application proper, eFix Pro, features a free scan for system issues. It’s arguable at this point whether or not its scan results actually reflect the current state of the OS, but one thing that can be stated for sure is that it intrusively and continuously reminds the user to upgrade to its paid version. There will be system tray notifications appearing off and on, and the program’s main console is going to be triggered after every Windows launch, because the respective executable gets added to the startup processes list. The verdict allegedly based on the eFix Pro scan says “Analysis complete. Problems detected!” It comes up with malfunctions grouped by the following categories: stability issues, security threats, registry, and Windows damage severity. The results look scary enough to encourage users into buying the software. In the meanwhile, the computer can be perfectly well. Given the obviously dishonest marketing leveraged by eFix Pro, continue reading the article to learn how to completely uninstall the applet and remove the associated adverse browser add-on. When the software returns a list of malicious and potentially unsafe items found on the PC, select Fix Threats in order to have the eFix Pro infection uninstalled from your machine. An additional virtue of this process is the elimination of other threats that may be active in the background. Given the likely persistence of this adware sample, it’s recommended to repeatedly check the machine for its components after the cleanup procedure has been performed. Rescan your system with trusted security suite to make sure eFix Pro virus extermination has been successful.